John 13:3-5 – 3 Jesus, knowing that the Father had given all things into His hands, and that He had come from God and was going to God, 4 rose from supper and laid aside His garments, took a towel and girded Himself. 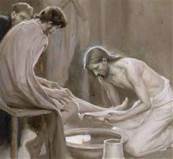 5 After that, He poured water into a basin and began to wash the disciples’ feet, and to wipe them with the towel with which He was girded. When you think about this famous passage of Scripture, I bet you don’t think about Jesus’ silence. Do you realize that without explanation or reasoning Jesus got up and started serving His closest friends? He was silent in His actions, choosing to act instead of teach or explain. He wanted His disciples to see how to serve with the greatest love. Without words. Without justification. Without explanation. Without fanfare. Without pomp and circumstance. Until He comes to Peter, the outspoken and brash disciple. Peter thinks that if anyone should have His feet washed it should be his Teacher. Peter is incredulous that Jesus would take on the lowest and grossest of tasks usually assigned to the least servant. That the Christ would voluntarily choose to do such a menial and undignified task. But Jesus had a purpose and a message for His crew. When Peter asked, Jesus told him “If I do not wash you, you have no part with Me.” (John 13:8b). He was saying Peter, you won’t be part of the worldwide movement I am about to start. Peter, you won’t be able to go out and teach people. Peter, you won’t be able to accept My forgiveness. Peter, you won’t feel comfortable or willing to be obedient. Peter, you won’t be able to go beyond your circumstances and mindsets to see the bigger things of God. Peter got it pretty quickly and begs Jesus to wash him completely (John 13:10). And then He explained to them what He was doing – teaching them how to reach people. He was setting the example of how to serve people so they would be open to hearing and seeing God (John 13:15). He was giving them the secret to connecting with people everywhere in a practical way that would get their attention. He was teaching them that actions are more important that words. For with our words we tell people we love them, but with our actions we demonstrate and display that love. James 1:22 tells us that we need to put our faith into action in order for it to be real and effective. It’s easy to talk the Christian talk, but are you willing to walk the Christian walk? Are you willing to love your neighbor as Jesus calls you to (Matthew 22:39)? Are you willing to go beyond the normal expectation to help someone (Matthew 5:41)? Are you willing to forgive offenses, even without an apology (Matthew 5:39)? Are you willing to be nice to and pray for those who do offend and hurt you (Matthew 5:44)? Are you willing to be a positive influence in your environment, to promote His faithfulness and goodness (Matthew 5:13-16)? Are you willing to give your time, energy, and money where God asks you to (Matthew 5:42)? Are you willing to obediently go where God calls you, even without a roadmap or directions (Genesis 12:1-4)? Are you ready to leave everything you know because God has called you into the unknown and a better future (Exodus 12:39)? Are you willing to stand strong and trust God in the face of potential danger to claim your inheritance (Joshua 1:1-11)? Are you willing to believe God is still in control when things don’t go your way (Genesis 39)? Are you willing to believe that God can deliver on any promise He makes (Genesis 15:4-5)? Are you willing to trust God with your biggest problems and be thankful in the midst of them (Philippians 4:6)? Are you willing to be content with whatever you have because God is in control (Philippians 4:11-12)? The best way to do this is to exemplify servitude. To serve willingly, gracefully, and happily wherever God places you. To give of yourself with a good attitude and a humble spirit (2 Corinthians 9:7). So love with actions. Help people, uplift people, encourage people, serve people. Be the start of the change you want to see. Be the positive attitude. Be the encouraging word. Be the smiling face. Be the hopeful voice. Be the warm hug. Be the friendly touch. Be the listening ear. Be the dream of tomorrow. Be the forgiving word. Be the grace that overcomes anything and everything. Be the light of His love, hope, grace, and forgiveness wherever you go. In serving and loving people will you find God and His great purpose for your life. You will be joyful and fulfilled and more able to connect with God. Start serving today! This entry was posted in actions, choices, love, serve and tagged actions, choices, love, serve on October 18, 2015 by maf4977.